Leveraging the benefits of eUSB 3.0/3.1 Gen 1 device controller, eUSB 3.1 Gen 2 is designed using the Intel FPGA built-in 10 Gbps transceiver. 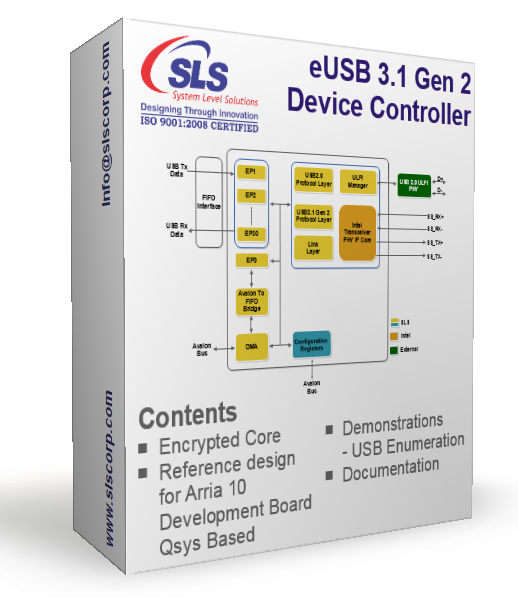 It is a one-stop solution for all USB requirements ranging from USB 3.1 to USB 2.0. It supports SuperSpeed+ (SSP), SuperSpeed (SS), High Speed (HS) and Full Speed (FS) communication modes. The Core architecture allows to use minimal pins from FPGA for USB 3.1 interface with better stability. It provides USB 2.0 backward compatibility using an external USB 2.0 ULPI PHY. It has been designed to provide simplicity and flexibility along with highest throughput i.e. >7Gbps. Avalon interface allows to manage the control transfer using software, provides flexibility, while FIFO interface allows to transfer the data over non-control endpoint ensuring highest throughput. Results are based on 1-Bulk IN and 1-Bulk OUT endpoint with 16K buffer each.